Douglas Olson’s “The Human Comedy After the Apocalypse: The New Way” is a suspenseful work of pre- and post-apocalyptic fiction taking readers on a journey through time. 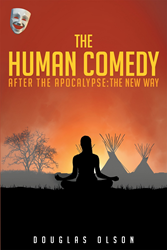 Recent release “The Human Comedy After the Apocalypse: The New Way” from Page Publishing author Douglas Olson is a creatively crafted work that explores the future and the possible collapse of human civilization. Douglas Olson, a husband, father, grandfather, previous Peace Corps member, 20 year-employee with the U.S. Bureau of Reclamation, 16 year-employee with the World Bank, spent his career struggling to make a difference and to contribute to the solution of the world’s water problems. What he concluded is that the water problems are not getting solved, and neither is anything else. Environmental degradation, loss of bio-diversity, climate change, and depletion of natural resources are all getting worse… heading towards disaster. Mr. Olson has completed his new book “The Human Comedy After the Apocalypse: The New Way”: a captivating and cultural look into the future and life after the apocalypse. Published by New York City-based Page Publishing, Douglas Olson’s mesmerizing tale is the perfect read for any post-apocalyptic fiction fan, or anyone concerned about the future of the human race! Taking off from the end of Dan Brown’s “Inferno”, World Health Organization Director Elizabeth Sinskey chairs a contentious meeting in Geneva. Many of the meeting attendees believe that Dr. Bertrand Zobrist’s attempt to solve the globe’s overpopulation problem is doomed to failure as are all other attempts to solve the myriad of enormous problems facing human civilization on Planet Earth. The problem is that it is impossible to get the Earth's governments, institutions, and people to agree on and implement a concerted effort to solve any of these problems, and it is impossible to adequately plan and implement any complex solutions because of the huge number of unforeseeable consequences and implications of any action or set of actions. They agree that there is an inexorable march towards the collapse of human civilization, or in other words, the Apocalypse. So they come up with a contingency plan called the New Way for how to do it right the next time, after the Apocalypse, assuming there is a remnant of human population left to have another go. Then the apocalypse ensues, which takes about 200 years to play out. During this time a group of Monks remain hidden, working on preserving the vast amount of human knowledge, as well as working on improvements to the New Way plan. They emerge to find groups of humans living as hunter-gatherers. The Monks work with the remnant humans and attempt to implement the New Way for humans to live sustainably on the planet and for the species to evolve and prosper. Does it work? Is it possible? The book explores these questions following the Monks and remnants in their quest. Readers who wish to experience this gripping work can purchase “The Human Comedy, After the Apocalypse: The New Way” at bookstores everywhere, or online at the Apple iTunes store, Amazon, Google Play or Barnes and Noble.